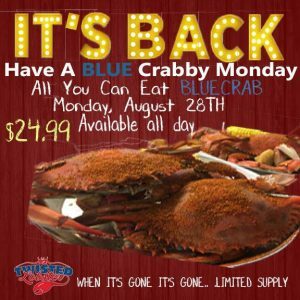 Have A Crabby Monday, Blue Crab Edition! Three Choices, each $12.99. 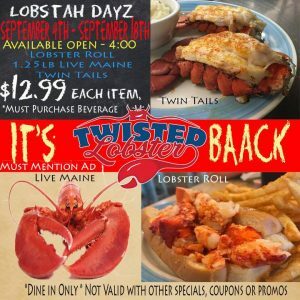 Have a Lobster Roll (hot or cold), Twin Tails or a Live Maine Lobster. This will be the last two weeks we will do this for a while so be sure to indulge. Dine in only, not valid with other offers or coupons! 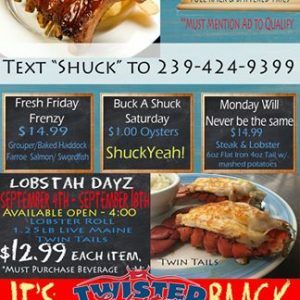 #ShuckYeah Lobstah Dayz are back. Every day from Sept 4th - Sept 18th open until 4:00PM. 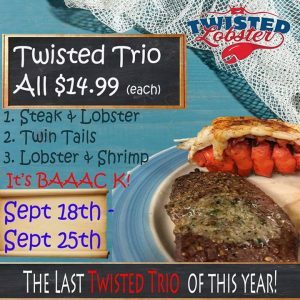 I guess there are two National Lobster Days...Lucky you and us, All You Can Eat Lobster is BAACK. 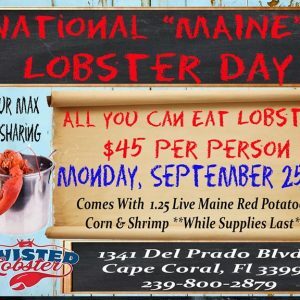 $45 for all you can eat Live Whole Maine Lobsters with corn, red potatoes and shrimp. 2 hour maxc, no sharing, whilke supplies last! #ShuckYeah let's do this!